How does Brazil work? How do Brazilians think? Understanding Brazil is crucial for anyone operating in the Brazilian market. Here are five books – in English – to help you find the answers. This is a text comissioned byt the Brazilian-Norwegian Chamber of Commerce (BNCC) published on their website February 1st. 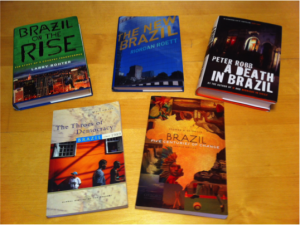 This is an overview of modern Brazil, written by New York Times correspondent Larry Rother. The subtitle, ”the story of a country transformed”, points out Rother´s project: explaining how Brazil has changed profoundly during the last three decades. The author shares insights about popular culture and arts, explains modern Brazilian politics, economy and the strive for energy self-sufficiency, and offers analyses about controversial issues as racism, environmental problems and the nationalist discourse concerning the Amazon. In this book, political scientist Riordan Roett elaborates on Brazil´s economic history. Focusing on the post-dictatorship period since 1985, Roett examines how the macroeconomic policy changed in the 1990-ies and explains how the Plano Real (1994) worked to stabilize the economy. He also shows how the Lula Government (2003-2010) inherited a number of orthodox economic policies, contrary to his traditional leftist discourse. The book is clear and well documentetd. It concludes with interesting considerations about Brazil as a regional power and as part of the BRICS. The strict focus on economic history, however, excludes important transformations in modern Brazilian society as the changes in religious preferences and the rise of the environmental agenda. That is not the scope of the book, but it is something that a reader wanting the whole picture will miss. In “The throes of Democracy”, historian Bryan McCann offers his analysis on six specific themes: The left wave in politics; poverty and favelas; land reform and the landless movement MST; popular music; religion and the pentecostal boom; and digital culture and media. Comparing with the two books cited above, McCann´s book is particularly strong on the cultural and religious aspects. Meanwhile, the strength is also the book’s weakness, at least for those who want to understand the whole of Brazil. It lacks many important issues, not least economic and foreign policy. Maybe it’s an unfair criticism, but with the subtitle «Brazil since 1989» my expectations were not fully met. Still, together with Roett´s “The New Brazil”, it´s a good match. In contrast to the three former fact-based books, “A Death in Brazil” is a collection of essays with a personal touch about Brazil, past and present. Author Peter Robb takes us on a journey into Brazilian politics and soap operas, through cuisine, history and popular culture. This book is a fascinating tale about a fascinating country, with sharp observations and thought-provoking interpretations. The section about former president Fernando Collor´s corruption scheme is particularly detailed, as is the description of dishes from the Northeast. Personally, I found the discussion about the lack of the sense of the common good in Brazil (p. 290), particularly interesting. It can be recommended both as a novel and as an introduction to Brazil. This is the classic book about the history of Brazil. In this revised edition, historian Thomas E. Skidmore takes us from the Portuguese explorers in the late 15th century to the Brazilian presidential elections in 2010. Both authoritative and accessible, this is the book to read to understand Brazilian history. The weaker side of the book is that it ignores the pre-Portuguese history. Moreover, Brazil´s indigenous peoples are only mentioned en passant, and the book underestimates the size of the current indigenous population. Still, I highly recommend it. Brazilians are Brazilians because of an extraordinary history, and this book gives you the best insights to understand modern Brazil.